Long before I wrote picture books, my sons literally had to beg me to take “true” picture books out of our library. I assumed picture book nonfiction was a shorter version of a social studies text. It didn’t take long before I found myself rereading these books after my boys fell asleep. How was the story moving along so quickly? How did the words work with the pictures? How did the authors and illustrators turn facts into art? 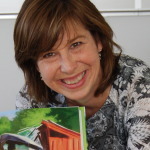 Now as a picture book writer I still love reading closely to find out how the best nonfiction or historical fiction picture books work. 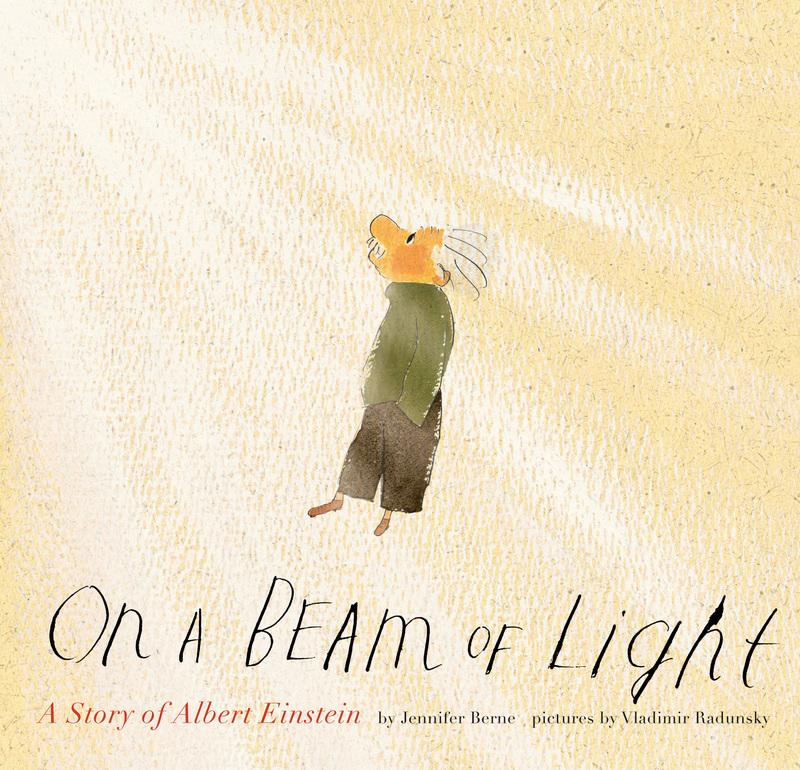 One of my recent favorites is “On a Beam of Light, A Story of Albert Einstein” by Jennifer Berne with pictures by Vladimir Radunsky. Jennifer and Vladimir manage to convey the world’s biggest ideas (time, space, relativity, quantum physics, theoretical math) as well as Albert Einstein’s life from birth through old age, from obscurity to fame. How? SIMPLY. Jennifer brings the cosmos into little Albert’s birth, “Over 100 years ago, as the stars swirled in the sky, as the Earth circled the sun, as the March winds blew through a little town by a river, a baby boy was born. His parents named him Albert.” In one sentence, she gives Albert a place in the universe and the universe a place in this story. Notice what’s left out too…the year of his birth, the names of the country, town, river, his parents or whether Einstein had siblings. On that same spread, Vladimir’s art is a scribbly line drawing of a black and white town, but the drawing of baby Albert is in shining color, subtly emphasizing exactly who is the star of this story. Einstein led a long, complicated life creating and studying ideas that most of us can’t even really understand—so of course, this picture book biography is short, human and as simple as can be. Which, as the book continues, turns out to be exactly like Albert too! Barb Rosenstock, Jennifer Berne, nonfiction, Vladimir Radunsky. Bookmark. Thanks for sharing. This is one of my favorite nonfiction picture books, too. I like how lyrical it is, and how it presents such abstract thinking in an easy way for kids. Lyrical is a perfect description! This book sounds simply delightful. I am going to find it and study it too. Thank you for the fine review and book recommendation. Right when I first started writing, I’d literally type out books I liked to see how they looked on the page…yep, studying other people’s work helps. I’ve read this book four times to figure out how the author managed to convey a long, complex story in a short, simple, and beautiful way. I really appreciate your insights into what the author left out. Seems easy until you try it. Thanks! It ALWAYS seem easy until you try it, you’re so right Charlotte! I’ve got an “easy” book I’m working on now that is literally driving me whacky! Simple is not simple. I just reserved a copy of “On a Beam of Light, A Story of Albert Einstein” from the library. Now, I can’t wait to read it. Thank you for the great review. Thanks for the great review, Barb! I enjoy seeing how much the illustrator of a non-fiction book leaves in or out, too. How they work within the parameter of having an identifiable and famous main character. And I couldn’t agree with you more about Art Directors! Yep, not to many people know what an art director does, yet they can make or break a book! And not too many authors are as bad at proofreading as me either…and I literally can’t find the “correct your spelling” button! Perfect example of a GREAT non-fiction picture book. Thanks for sharing your thoughtful insights. I’m going to check this one out!! The more I read nonfiction, the more I love it. Such a valuable blend of art and information. Thanks for sharing–can’t wait to read this one, too! 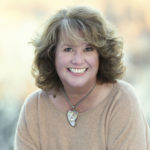 If I helped convert you to nonfiction Rochelle, you just made my day! 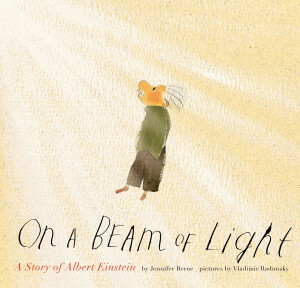 I’m a HUGE fan of nonfiction picture books, and On a Beam of Light is one of my favorite. I also loved your Benjamin Franklin’s Big Splash book too–very fun approach, Barb! Thanks Maria! Now THAT was a simple book that turned out to be not simple at all to work on…it took about 6 months to get it right. Wow – sounds AMAZING. Just requested it from my library. Thanks so much. Just LOVING this blog, by the way. I cannot say enough great things about this beautiful book. A favorite in our house for sure! Kudos to both author and artist. Thanks for reading Kristin, we all learn so much from each other’s work. Thanks for this review–I adore this book. The text gives such an intriguing picture of Einstein as a person and the illustrations are perfect. You could spend 6 blog posts on those illustrations, right Ellen? Brilliant…the ones of Einstein’s parents…honestly so much emotion in like 10 pen strokes! I love reading great non-fiction picture books. Thanks for highlighting this one, Barb — it looks excellent! So excellent, thanks for reading! Einstein would be proud! What a gorgeous book!